A denim jacket is my in-between season go-to. I have three of them, that's right, three. They can be worn with pants, a skirt or dress. Roll the sleeves up, or leave them down. Go buttoned or open. Layer, or not. I was a teenager through the 1980s and your denim was either acid-washed or trimmed with lace - Madonna-style - or pretty florals. I'd cover my back jean pockets with Liberty-like floral prints, or put in fake linings around the ankle so I could roll the hems up and have the patched lining showing. Denim tops too were embellished with lace, floral patches or embroidery, and by the look of it, these floral embellishments are on their way back around. Here, here, here and for the prices I could never pay, here. When I spied these at the bottom of a basket of odds and ends, I think I may have made a little audible gasp of disbelief. If you believe that objects hold some sense of their former life, you will know I felt some sense of the young, scrawny, hat-too-big-on-his-head lad that had earned these. I felt instantly sad for this lost moment from his youth. Here, among his mementos, I could read that he liked sports and that his preference for solo sports (swimming and running) to team sports (hockey) meant he was probably an introvert. That campfire badge there tells me too that he liked Scouts. 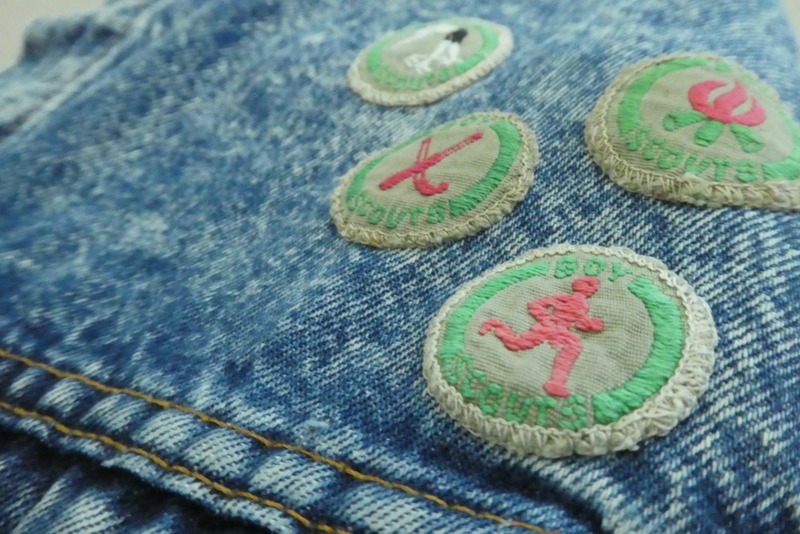 The campfire badge was one that kids who liked outdoor craftsmanship tended to earn first. 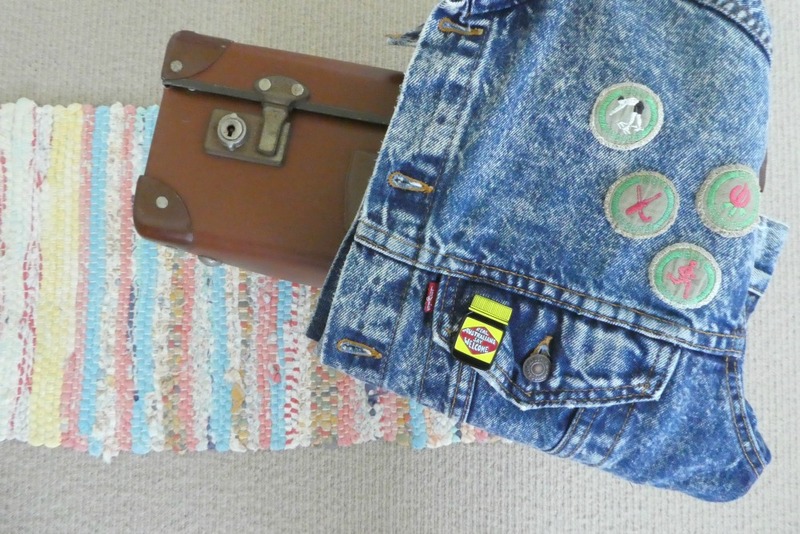 I didn't know the person who owned these badges but I felt their worth, his worth, and they've made their way to one of my favourite jackets - a stonewash denim I bought at the Brooklyn Flea, on a trip to New York, a few years back. I have a few more to stitch on, but I suspect this is a jacket that may, over time, be covered with these small nods to nostalgia. I while back I found a poncho in a blanket material covered in old Scout and Girl Guide badges, all from local groups and gatherings that would mostly be sadly defunct. (In a second hand shop) It disappeared quickly and I was sad I didn't grab it, but really I had little use for it. I also recently found a very worn cotton pillowcase with the Broken Hill Girl Guides printed on it. I don't know that many groups would have pillowcases printed these days? I bought this and passed it on to a local Guide leader who is my cousin. I feel a connection to this memorabilia although my time in Guides was very brief. Is Kate your cousin? Small world. I was the most recent past deputy state commissioner of GG NSW&ACT and this time last year I was at the WAGGGS Asia Pacific Conference. So much Girl Guides in my life, though I am doing very little at the moment. Work and study is fulltime and a bit, and there's a new grandchild due any day now, so things are going to get a wee bit cray here soon. Always lovely to have you stop by. This is superb! I had no idea a patch could look this good.